human behavior towards natural world. Plato and Kant presented this ethic. The concept describes that fundamental ethics are universal and unchanging. The rules of right and wrong are valid without concerning the interests, desires and attitude. God has created these rules or these are revealed for any reason and knowledge. This ethic was of Sophists. It claims that moral principles are relative to any particular person, society or condition. Ethical values are context based. Friedrich Nietzsche's said that there are no facts only interpretations. This ethic was given by Schopenhauer. Very dark view was given by him. He said the World has no sense at all. Life is dark. To exist on earth unceasing struggle is required. Its just like eat or to be eaten. There is no such thing that is good in life. Life is about suffering, pain, uncertainty and despair. Land Ethic was presented by Aldo Leopold. According to this ethic, Land is not considered as mere object or dead thing to be owned as property. According to this, preserve all the forms of life on the earth to maintain the stability of world. When small changes occur in the system, the system self sustained it. Leopold made a conclusion that a thing is right when it maintains the integrity and stability of biotic community otherwise it is wrong. This ethic represents the views that there should be care of the place and to manage it properly. We are partners of nature rather than masters of it. There should be collaboration with nature to sustain it and make it a better place. According to Islamic Scholar Dr. AbuBakar Ahmad Bagader " everything in this universe has the value. God gives the humans stewardship on the earth. And man is a manager on earth not a proprietor, a beneficiary not a disposer; Man should care the earth and use it as trustee. It is a pluralistic (Freedom of Thought), relationship oriented and non hierarchical philosphy. According to this people see themselves in coperation with others not in competition, network of personal relationships rather than isolated egos. This ethic is about utilization of resources. Jeremy Bentham has the philosophy that said Goodness brings happiness and happiness brings pleasure. John Stuart Mill said that pleasures of intellect are greater than pleasures of the body. By inspiring these philosophies Giffort Pinchot believed that greatest good for the greatest number of people for long time. It is a human centered approach. It describes that humans only have intrinsic values that have only worth. Things are good because they are human interest. Animals are valuable because humans use them for various purposes for their ease. It is a life centered approach. Famous phrase regarding this ethic is revenge for life means to enhance life not to harm it. It is based on ecological perspective. 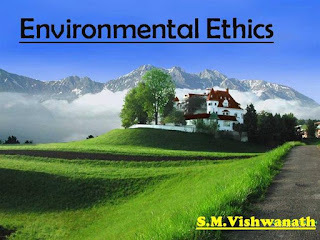 This depicts that not only living organisms but also non living things such as forests, rivers, also have moral values.